This is a matched assembly removed from an ASCS 360 Sprint Car Motor. 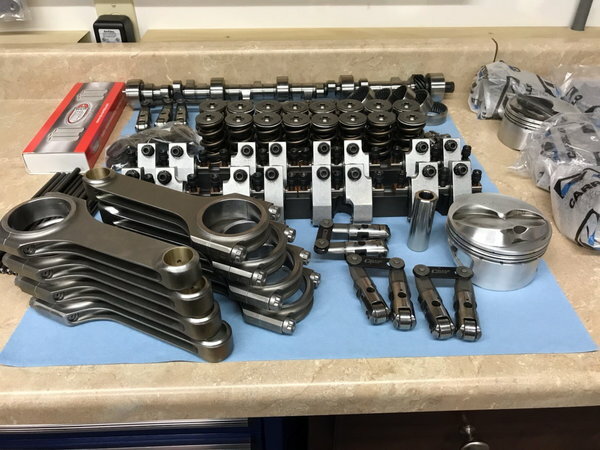 The assembly has "fresh" Carrillo 6.200 Rods with new bolts, CP 23 degree Compression pistons and Pins, Bullit 262 / 268 duration camshaft, Morrel .842 Roller lifters, 5/16" 7.850 1-piece pushrods, T&D 1.6/1.5 Rocker assembly, Isky 9995 Valve Springs, Titanium Retainers, and Ti 5/16 and 11/32 captive bead locks, and Sheet Metal Aluminum valve covers. All components have been clean, inspected, and measured for re-assembly.